Through her series of comics titled “Baopu,” Artist Yao Xiao illustrates how communicating our appreciation rather than apologizing for being vulnerable or existing creates a more connected and positive experience for both parties. 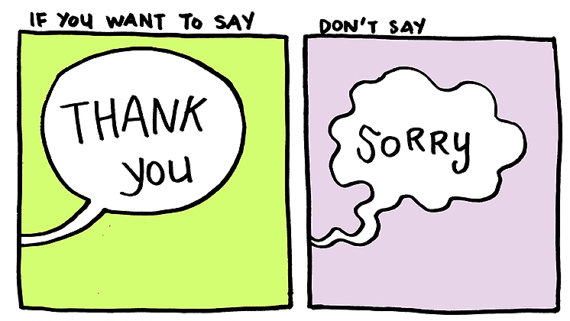 To not say sorry is to feel confident, loved, and appreciated…it is me telling myself “It’s OK’, and telling someone else I appreciate them back. Apologizing for being present/being vulnerable and open was something I used to do…acknowledging that you appreciate someone who cared for you is a very nice thing to do and makes both parties feel great. Consider the difference for your listener. If you apologize, they may be placed in a position where they want to reassure you that everything is OK. It becomes about you. If you thank them, they can feel appreciated, understand how you feel, and feel more connected to you. 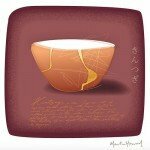 You can find the artwork of Yao Xiao on Etsy. Kathy is a Licensed Professional Counselor in Austin, Texas. 360 Counseling is her private practice.